Since Halloween is here, I wanted to highlight a creepy painting to delight (and horrify!) my readers. If you think that Peter Paul Rubens only painted rosy-faced saints and voluptuous women, think again. 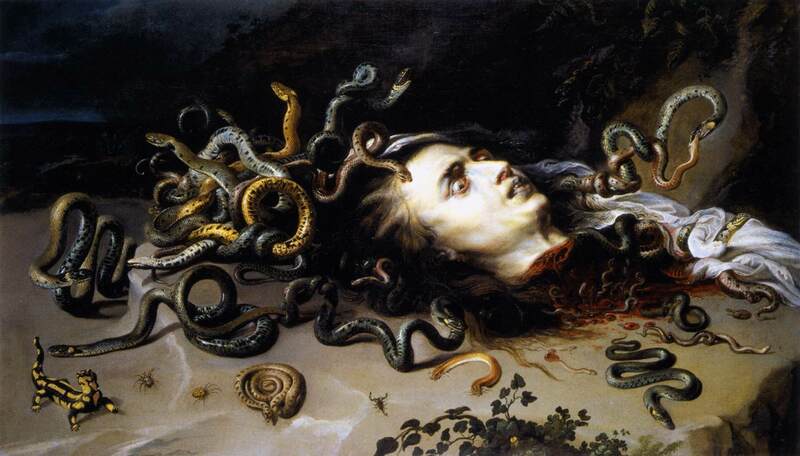 A few weeks ago I came across Ruben’s painting Head of Medusa (c. 1617, shown above). This is the creepiest painting by Rubens that I have ever seen. Medusa’s dead eyes stare into the distance, while her snakelike hair continues to writhe and squirm. Eek! Actually, I am reminded of one other Rubens painting which includes some similarly dark subject matter. Miracle of St. Ignatius Loyola (c. 1617, about the same time as the Medusa painting) also has wide-eyed demons writhing in the background. In fact, the Kunsthistorisches Museum in Vienna (which owns both paintings) suggested that there are some stylistic comparisons between the demons and Medusa. It is thought that when making the Head of Medusa, Rubens was influenced by Italian masters like Caravaggio (who had painted the same subject matter in 1598-99). I tend to agree with the argument that Rubens made this painting for a connoisseur (and perhaps collector) of both paintings and natural objects. Rubens certainly pays keen attention to the various types of snakes, bugs, and creepy-crawly things. Do you know of any other “dark” works by Rubens? These are the only two of which I am aware, but there may be more out there. 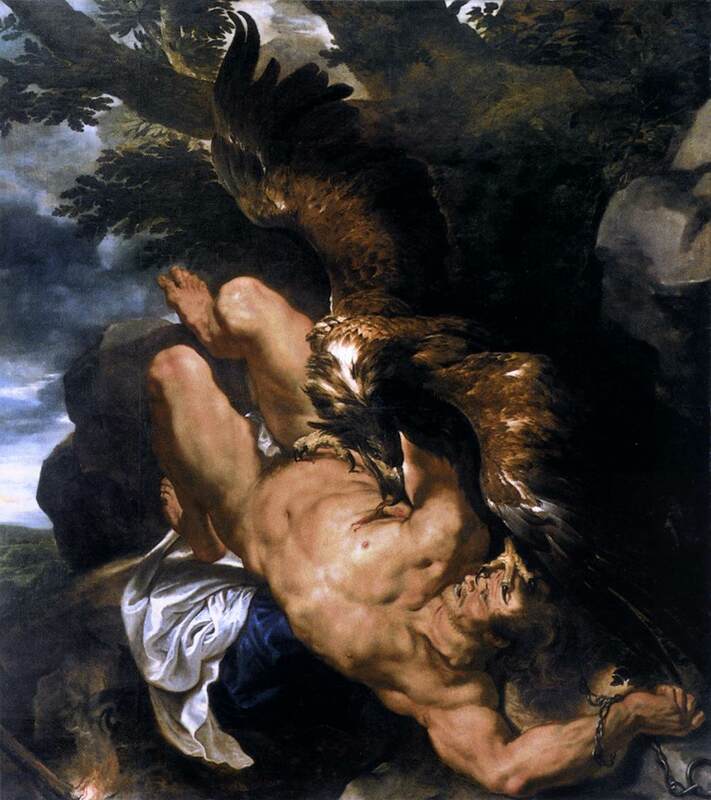 Well, there's Saturn Devouring his Son(Goya's not the only guy to do this) and possibly his Prometheus Bound. Oh yeah! Good call, Douglas. Thanks for your comment. I completely forgot that Rubens had also made Saturn Devouring his Son (1636). I wasn't familiar with Prometheus Bound before your comment, either. That is a little dark and gross, too. And the strong diagonal composition makes the viewer feel especially unsettled. There's a lot of gory stuff in the Baroque, particularly in Spain, though it is mostly religious stuff. I think some of Goya's work is particularly intriguing because he seemed to be one of the first artists to really be interested in journeying down a dark path. I have a very interesting clip of Andrew Graham Dixon visiting his house – I must dig it out and post it! I love it when your posts give me ideas M! Aren't Rubens' regular paintings scary enough? heidenkind – your comment made me laugh out loud. These dark Rubens paintings are very interesting! For those interested, I've included the aforementioned clip in this new post. It features a visit to Goya's birthplace and a quick tour of the Black Paintings exhibit at the Prado. Thanks for the comments everyone! I especially liked watching the clip H Niyazi included on his Goya post. I'd recommend others to check it out. heidenkind, your comment made me laugh too. That would be too creepy to try to reproduce for Howlerween. Any ideas on how I can make a cool headpiece for a Medusa halloween costume?